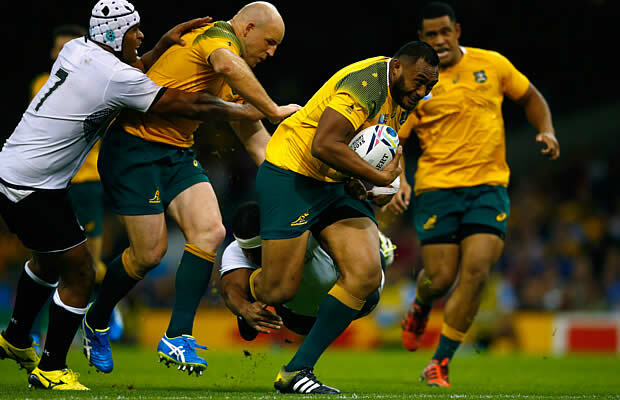 Australia kicked off their 2015 Rugby World Cup campaign with a 25-13 Pool A victory over Fiji but failed to earn a bonus point for scoring four tries. Australia are in a tight battle in Pool with England, Wales and Fiji for the two available places in the quarter finals from Pool A.
Wales and England both earned bonus points from their opening matches and Australia’s failure to score the fourth try could be crucial later in their campaign. Earlier in the day Scotland were comfortable winners over Japan who also had a short turnaround but Australia were unable to pull away from Fiji. 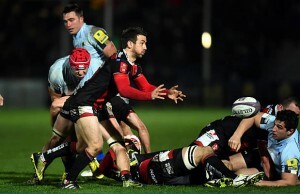 At half time it had looked like the floodgates would open in the second half but the teams could both only add ten points each in the second half. Two of Australia’s three tries were scored by David Pocock from rolling mauls as he did several times earlier in the year for his Super Rugby side the Brumbies. Twice in four minutes, Pocock was driven over by the Wallabies’ effective rolling maul after they spurned kicks at goal in favour of attacking line-outs. Taking to the field just five days after a 35-11 defeat by England in the tournament opener, the Pacific islanders scored a try through Australian-born fly-half Ben Volavola, with giant wing Nemani Nadolo kicking the conversion and two penalties. dominance after the islanders strayed offside. with one of their own. in front of the posts to draw the teams level. driven over after the Wallabies again ignored a kickable chance in favour of an attacking line-out. Fiji suffered a hammer-blow when Campese Ma’afu was yellow carded on the half-hour after preventing quick ball for the Australians. Foley again kicked for the corner and Pocock bagged his second try after a perfectly executed rolling maul trundled over the whitewash. the tighthead prop barging over from close range for a try Foley converted. Nadolo responded with his second penalty and Fiji then decided to run everything, with mixed results in the face of their own inaccuracy and a doughty Wallaby defence. past Rob Simmons and rolled out of Foley’s attempted tackle for a try converted by Nadolo. 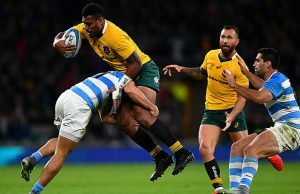 Foley kicked his third penalty in the 70th minute, and then Fiji-born Wallaby centre Tevita Kuridrani was yellow carded with seven minutes to play after infringing in a tackle on his cousin Nadolo. Australia were then content to batten down the hatches and Cheika will now try to rally his team in a bid to rack up a huge score against Pool A minnows Uruguay in Birmingham on Sunday.